My name is Alex, and it's been so exciting stalking your website and blog as of late. Not to start off creepy, but your work is very inspiring and empowering to me who is trying to jump in fully within the industry myself. I have been doing weddings and any other sort of commercial work I can scavenge along the way for about a year now. I recently (like yesterday) left my job, and hoping to follow my passion within this industry (film/video, storytelling, weddings, etc.) I've taught myself everything (which isn't much). I learn from other film companies (such as yourselves) and latch onto bits and pieces to help grow and challenge myself in my skills. I caught onto Stillmotion awhile back, and they have mentioned some of your stuff in their blogs, and that's how I stumbled upon your work. My wife and I live in Tennessee, and we got married this past May. I'm 24, and ambitious about seeking this new gift I have found, or think I have found. I know I have a lot to learn, but I wanted to introduce myself to you to see if you had any tips or thoughts on how you started and what set yourselves apart from the rest. I do see you put a lot of your skills in not only finding the story, but determining "who" it is that is involved in the story and what makes them who they are. Very awesome. I would love to connect better with my clients, and from the product of your work, you guys breathe that in every film. 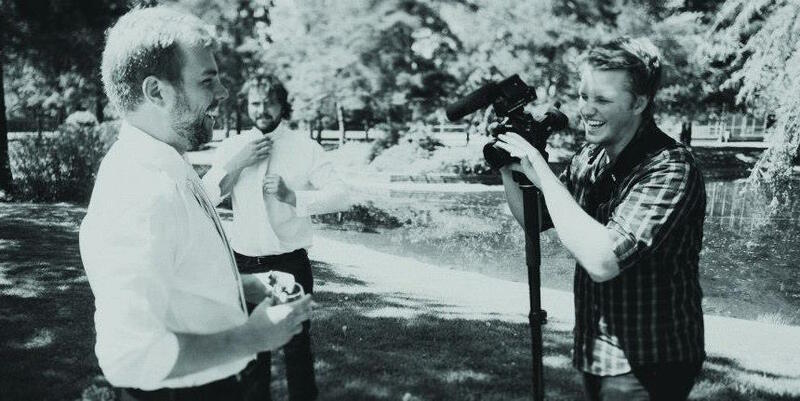 When we were first getting started, we were passionate and eager to make compelling and exciting films. We wanted to move people emotionally, to change how they looked at the world, and to leave a lasting impression. We quickly realized that that doesn't just mean cool shots and an upbeat song. Story had always been important to us, but in the beginning it wasn't what we put first. It wasn't until going to film school that it really sunk in that Story is king. It's one thing to say, but another to truly realize it. "The films that I constantly revisited or saw repeatedly held up longer for me over the years not because of plot but because of character, and a very different approach to story." When we approach a story, be it a wedding or a commercial project, we want to find out about the main "characters" that will be in our story. For weddings, this is often but not always only the Bride + Groom. These are real people. No not just "Man in suit" and "Woman in dress", but real people. We want the films we make to be unique to the couple and the only way you can truly do that is to get to know them. An example of this is Robyn + Joe. We don't live very close to Robyn + Joe, in fact we're not even in the same Province, but we didn't let that get in the way of us learning as much as possible about them. Through hanging out with them on Skype, emailing, and meeting them in person the day before the wedding, we went into the shoot having a clear vision for the story and the characters that would drive it. We find this to be KEY in telling a unique and personal story. Like Alex kindly said in his email "...determining 'who' it is that is involved in the story and what makes them who they are." The important thing to remember as a storyteller is that YOU are the one telling the story. Your perspective is unique. No one else has it. A common mistake is going online, seeing what's popular and then mimicking that in your films. It's OK to be inspired by what you see others doing but don't imitate, innovate! Push yourself. Find your own vision and follow it. These are things we often remind ourselves of. Another mistake can be getting sucked into all the latest gear and equipment and saying to yourself, "Oh man, if I only had this camera then I would make great films!". Sorry but that is not even close to true. Story is king. Not the gear. If you're a storyteller, go out and tell your story. You don't need a RED, just grab an iPhone or whatever you can get your hands on and get to it! Apologies for the super long post, but this is something we're super passionate about and have been wanting to talk about for a long time :) Have thoughts on this post or questions for a future Q+A? We'd love it if you would leave a comment below. Maclean and I have been together for eight and a half years. I know him pretty well. Even when we were dating we spent almost every day together, we work together and for the past almost four years, we have lived together too. I should know who his friends are… right? I have always known who ‘Devon Penner’ is. Maybe from church, or from Maclean’s tiny school, but I’ve known who he is. This young kid with great style who went off to the States to become a Chiropractor. So impressive. But for many years I didn’t know that Devon and Maclean were buddies. How did I miss this? One day I look over as Mac is reading an email and it's the length of an essay! I asked him who it was from. Devon Penner. Mac starts emailing back. Another essay. Mac doesn’t write essays. He’s never written me one… Well that must be because I am not his secret movie buddy. I didn’t think anyone could love movies more than Maclean. He really loves movies. His dream birthday party is a kids pizza party at colossus followed by a movie. (Unfortunately you have to be under 12 to do that… and no you can’t just bring one kid.) But Devon really loves movies. He has actually watched ALL the movies. This might be even more impressive than the fact that he is a Chiropractor. Maclean and Devon and movies have a very special relationship and I’m so happy they found each other. Devon is probably even more happy that he found Haleigh. She watches all the movies with him and also married him. Can’t beat that! These two have an adorable story that started long ago. Rather than give it all away in this post, we think you should watch their movie. haleigh + devon || the hunt is over from Hello Tomorrow on Vimeo. The vendors at this wedding were the complete dream team. We had a blast as always working with the incredible Filosophi Events who delivered a gorgeous and seamless day once again. Our friends Shari + Mike photographed the wedding and it never ceases to amaze us how passionate, hard working, and talented these two are. Not to mention flat out awesome. The whole day was beautiful and beyond fun and we can't wait to work with these people again! As you already know, story comes first in all we do. We want the tools we use to free us from the technical and allow us to tell the story in the most creative and effective way possible. For us this means our trusty Canon C100s and Canon glass. But for a while now we've been eyeing the Sony A7s (if you don't know about it, check out Philip Blooms review of it here). This camera has some killer features like it's amazing low light ability, slow motion, full frame sensor, and most of all it's size (the thing is tiny). We finally caved and picked one up and this was our first wedding using it. Our minds were blown after using it on this shoot. So much punch in such a small package. We were able to shoot at insanely high ISO's and stop down to get a deep depth of field in extremely low light situations, something that hasn't been possible before. We loved being able to quickly jump into 60p to capture certain moments in slow motion which we have missed oh so much since the C100 mk1 doesn't have 60p. Also with the camera being the size of a small rangefinder, we were able to shoot even more candidly than before. From the subject's perspective we just look like a guest with a camera. All in all this camera is an awesome addition to our wedding kit. It can't quite replace the quality and ease-of-use of the Canon C100, but it is the perfect B cam and a great tool to have. This film is a must see. So see it! janelle + dustin || i choose you from Hello Tomorrow on Vimeo. loowa + joey SDE || first & last from Hello Tomorrow on Vimeo. As you know we always harp on about storytelling and the importance of being prepared, and SDE's are perhaps the best example of the impact pre-production can have. There is a lot to juggle on any given wedding shoot... being at the right place when you need to be, traveling between locations, lugging all of your gear around, shooting with purpose, capturing audio from multiple sources, etc. But on a SDE we add the massive undertaking of creating a film the same day of the wedding, and that can feel quite daunting. But if you know the story you want to tell and are prepared, it can be so exilirating and dare I say fun! We wanted to share this post to give you a little insight into what goes into putting together a same day edit. First off is the plan of attack. We didn't want to just go into this shoot blindly and hoping for the best. We wanted to be as prepared as possible. Fortunately we were able to meet and hang out with Loowa + Joey multiple times before the big day, which really helped us get an idea of what was important to them. During these hangouts they told us about how they were planning on exchanging cards + gifts with eachother. We knew this would be a key part in the telling of their story so we wanted to make sure we captured this moment well. A big part of that was making sure we had great audio so we decided to use small lavelier mics and placed them under their clothes. This added a bit of trickyness as it meant we had more gear to carry with us and had to take the time to mic them up, but we feel it makes a huge difference and really helps keep the audience in the story. Crappy sound is all too common and is often the first thing that takes someone out of the story. We also learned from Loowa + Joey that the guys would be doing a little pre-wedding workout + swim in the morning. We really wanted to make sure we were there to capture this since it reveals how Joey + Loowa love to have fun. Even on a potentially stressful day, Joey still wanted to just be a kid and play in the pool with his buddies. That says so much about him in such a simple way. One thing we didn't learn about until a couple days before the wedding was that they would be getting a big ol' school bus to drive them around for the day. Seriously... a legit big yellow school bus? Amazing! We knew we had to incorporate this childlike element into their SDE. What better way to show how these two are basically two kids just having fun? Knowing all of this ahead of time, along with making notes, shot lists, song selections ahead of time (thank you Marmoset! ), edit layouts, and having the proper equipment allowed for us to tell an depth story in an engaging way. These are merely a few things we wanted to highlight about putting together L+J's SDE. We also had tons of help from the amazing crew of Filosophi who ensured we had everything we needed and that the schedule worked for us. As always it was a blast working along side our friend's the amazing photography duo Shari + Mike! We also want to give a huge thank you to our pal Andrew Noon for helping us on this shoot and for being flat out awesome! Loowa + Joey, you two are so wonderful and insanely fun to be around. Your wedding day was beautiful and we were so happy to be there with you. Thank you for letting us tell your story! We'd like to talk about a friend of ours named Jamie. We go waaaay back with Jamie. I think it was about 8 or so years ago when I met her at Southgate Church shortly before Erin and I started dating. Erin however, goes back even further as she and Jamie went to school together. To be fair, they were 4 grades apart but still. Wow. It wasn't too long after I met Jamie that she started up her photography business and Erin and I quickly became blog stalkers. It was incredible to follow along on her journey to success and watch her work progress so quickly. When we started filming weddings she was always extremely helpful with tips/advice and we were even fortunate enough to film her first promo. A few years later Erin and I got engaged and it was an absolute no brainer to have Jamie photograph our day. (Check out our engagement shoot and wedding on Jamie's blog!) Over the years we've been lucky enough to work with Jamie on a bunch or weddings/projects, including her 2nd promo which you can watch here. But recently we decided it was time for an update. A couple months ago we started working on Jamie's new promo. Jamie had the idea to try a different approach to showing her personality, and we thought we might try slowing it down a bit. Jamie is super laid back and easy going and it felt right to portray that side of her this time. Let us know what you think of the result! TECHY STUFF When Erin and I talked about how we wanted the visuals to look for this project, we initially thought of heavily using completely static shots. But as we talked about it, we realized that Jamie's laid back, yet bubbly personality couldn't be portrayed without a little movement. This brought up the idea of using handheld. We're always very wary of using handheld in our films. The story/project really has to lend itself to handheld and we never want to use it just because it's quick or convenient. Also since we shot on DSLRs for so long, shooting handheld was a more complicated option because of the need for a rig. But now with the C100 it wasn't a problem. The ergonomics and weight of the camera really allow for beautiful handheld without a rig. However if we were planning on shooting anything with a 50mm or higher we would definitely need a rig, but for this project we wanted to keep things pretty intimate so we shot almost entirely on the 24mm and 35mm. Some may think that the only way to have a personal and intimate wedding is to have extremely emotional vows, invite only 20 loved ones, and hold the ceremony in a location in the middle of nowhere. While that would definitely be a great event, it is not the only way, and we believe in that now more than ever. This past week we had the honour and privilege of filming 4 days of Amrit + Gurp's wedding and celebrations. This was without a doubt one of the most intimate weddings we've ever been to and there were over 1000 people who attended. Yup… three zeros. It may seem impossible to have an intimate wedding with that many guests, but let me assure you that every aspect of this wedding was from the heart. There were so many moments of laughing, dancing and cheering, followed by moments when everyone was fighting back tears. It is rare for us to be able to cover multiple days of a wedding, and this allowed us to learn even more about the couple and their families and loved ones. We were able to witness Amrit and Gurp truly being themselves among the people they've grown up with, and catch glimpses inside of life long friendships and meaningful relationships. We felt so appreciated and welcomed by Amrit and Gurp and their families which made us feel even more comfortable to do what we needed to do to capture the moments we knew we wanted to tell their story. Amrit and Gurp asked us to put together a next day edit for them to show on the last day of the celebration. We hope you enjoy the film! 1. Ergonomics/Size - The thing just fits in your hand so perfectly. The side handle allows you to have the perfect grip and still have easy access to the controls you use most often. Also this camera is not a whole lot bigger than a 5D with a battery grip. The weight is a bit more noticeable when flying around on a glidecam but other than that it wasn't a problem. Also the swivelling screen is amazing. Just to be able to angle the screen where you need it instead of getting on your belly for low shots or straining to see when shooting above your head. Oooh man, it's great. 2. Dynamic Range: We shot this wedding with the Wide DR profile and it was SO nice to not have the sky blown out while shooting outdoors. The footage was also fantastic to grade in post. 3. ND Filters: Gone are the days of franticly screwing on an ND filter to the end of your lens. It allows us to be so much quicker, especially when switching between indoor and outdoor scenes. Now there are also many more features like peaking, waveforms, onboard XLR inputs etc., that are fantastic. My only wish is that the sensor was full frame but it's definitely not a deal breaker. We are extremely pleased with the switch to these cameras and we feel that we'll be able to use these tools to be more effective storytellers. These are after all just tools. It's the story that matters. Two new highlights films in one week!?! Whaaaa?! Yup it's true! Bonnie and Christopher (aka Denman) are two incredible people and we go way back. I first met Denman while I was in film school as he was a good friend of my classmate Joshua (of Joshua + Bonny Jo). We got along great but didn't have a whole lot of time to hang out as he was visiting from Texas. The next time I had met him was when I went to Dallas to film Joshua and Bonny Jo's wedding. Denmand was Joshua's best man so I was able to spend a few days with him and all day at the wedding. He had just started hanging out with this girl Bonnie that Joshua had set him up with. I was lucky enough to meet Bonnie and she was a joy. Super fun and a great fit for Denman. They were both smitten pretty quick. Fast forward 6 months and I'm flying back to Dallas again to film Candi and Daniel's wedding and next thing I hear they're engaged. They didn't want to waste any time. Denman was nice enough to take me out one night for a bite to eat at a classic Dallas drive in burger joint. He asked me if I'd be willing to fly out to Dallas the following year to film their wedding. I was beyond excited and honoured. So last week I flew out to Dallas. What you may not know about Texas in August is that it's hot… and I don't just mean a little uncomfortable… I mean it's hard to breathe it's so hot and humid. And on top of that, Dallas apparently was going through a worse than normal heat wave and has been setting heat records. We're talking 110 degrees fahrenheit at 11pm. Oofta! So I arrived a few days early to spend some time with Joshua, Bonny Jo and Denman. I was able to go along to the rehearsal dinner and check out the venue and it was amazing! It was looking over a nearby lake where Denman and his family have a cabin. I was later told that Joshua and Denman have this old pastime of Canoeing on the lake early in the morning and they said they were planning on doing so before the festivities started on the wedding day. I immediately asked to tag along as I thought it would be a great way to start their film. The wedding day was beautiful. It was hard not to have a smile on my face the whole day, being surrounded by such incredible scenery and seeing the joy and love on Bonnie and Denman's faces. I was so happy to be able to create their wedding film. Ok so there are a few shots in here that I was thrilled to be able to get. During the morning I was able to take my mkii and glidecam and head out on a small boat with Joshua and Denman. I wanted to get some shots of the scenery and of the venue where the ceremony and reception was to be held. Having the glidecam while on the boat allowed me to get some extremely high production value shots. See if you can spot them in the film. Also another note about this film is that it was shot entirely with one shooter. We don't often shoot one shooter weddings but this was a rare exception. Fortunately the preps, ceremony and reception were all held at one location. I had to be very aware of the schedule throughout the day to make sure I could capture what I needed. It's cool to see that if you have a vision for the story, you can be where you need to be and make it appear to be that there was more that one shooter. The gear used was the 5D and 7D with L series primes 50mm 1.2, 35mm 1.4, and the 135mm 2.0. For the ceremony and speeches I set the 7D up on the tripod and then used the 5D on the monopod to get other angles. It turned out great. Obviously not my preferred way to shoot as it can be a little hectic, but I was happy to see the footage turn out so well. On July 23rd, Catherine and Abe tied the knot. The conditions couldn't have been better for their wedding day. The sun was out, not too hot, not too cold but just perfect. The wedding day was full of laughter and joy and you could really see it on everyone's faces. Catherine and Abe's loved ones were all so happy to see these two get married and it was definitely one big celebration. The ceremony and reception were held at the amazing Vancouver Convention Centre. This was our 3rd time shooting there this year and it never get's old. Such a beautiful view of the north shore. We had such a fun time shooting this wedding. Check out the highlights film below! Also we had the pleasure of working with Jana Vackova Photography again. We always have so much fun with Jana and Lisa. A big thanks to Lina Dang of The Flower Girl Event Planning for helping the day run smoothly and making sure we always knew what was happening. Lina's the best. So rad. Since we've shot there before and have plenty of footage of the view, we wanted to try something new and get a shot of the VCC from the north shore (which we open the film with). So a few days later Erin and I headed out to Vancouver to do a little pick up shooting. Sometimes what you want to shoot and the craziness of a wedding day schedule don't line up, so pickup shooting is a great way to get the shots you want and to really add something special to the film. This past weekend we took a road trip to Red Deer Alberta for my cousin/life long friend Drew's wedding. I was honoured to be in the bridal party with a great group of close friends and family. So many good times on the road and in Red Deer. Early wednesday morning we headed out with my sister and brother in law. Driving from Surrey to Red Deer is about an 11 hour drive so needless to say we had to find ways to entertain ourselves while on the road. For me, one of those ways was by taking a few snapshots and shooting some video. You can view a little brief video along with a 'techy stuff' blurb at the bottom of the post. We made a few stops along the way and one of them was to Lake Louis. We really wanted to see this gorgeous lake, but also my bro-in-law Steve and I really wanted to watch the Stanley Cup Final and we knew we had some family staying at the Fairmont Hotel. So we crashed there room and watched the game. After the disappointing game we got back on the road. I've known Drew my whole life. Besides being cousins, we've been extremely close friends and even roommates. I'm the youngest and he is the third youngest out of our huge batch of cousins so naturally we were pretty close growing up. We have always been in to the same music and are even in a band together. It's rare that Erin and I get to attend weddings, let alone one of us be in the bridal party. We had so much fun enjoying the festivities and living it up in Red Deer. It was so awesome to see him and Danielle tie the knot and I can't wait to hang out with them as a married couple. Here is the little video I shot on the road trip. Please pardon the shaky cam... didn't have the monopod with me. I put this together mainly to test out the new Final Cut Pro X. Great system but not quite there yet. Hopefully Apple will listen to their pro users and implement changes in future software updates. One thing that is an absolute game changer for me is skimming to preview clips. Huge time saver. I also wanted to test out our new iMac. We've been wanting to upgrade for a while from our 2006 Mac Pro but we wanted to wait for Apple to release there updated iMac. The second I saw that it was available I put my order in. The specs are... 27 inch iMac 3.4 GHz Intel Core i7 16 GM RAM 250 GB SSD & 2 TB HDD This is an amazingly powerful machine. The SSD is a huge performance boost, along with the i7 chip. Our processing and editing times are drastically improved. This tool will be a huge help in this years weddings.